The fact that David Boutflour made his statement on September 12th strongly suggests that the whole performance of finding a silencer on September 11th (to be backdated in witness statements) was set up. The police must have explained the purpose behind the deception. The relatives play acting shows they knew what the police required and what it was for. The way the relatives all make statements corroborating the finding on the 10th of August with each noticing the blood and paint on it and so on, shows that they willingly participated in the framing of Jeremy Bamber. The fact that the statement recording the "finding" was ready to be signed only a day after it was found makes it seem likely that the plan involved telling the relatives to go to the farm on September 11th to collect items which had been deliberately left there by the police. The police must have explained the plan to the relatives. David Boutflour was to look in the gun cupboard and find a silencer along with other items with the exhibit references given above. Then he was to sign a statement dated September 12 claiming to have found those things on August 10th. Lets take a closer look at that alleged "Telephone Message Log" that seems to be foundation of this conspiracy theory. Here it is. What is this? Lets take a step back and look at the bigger picture. 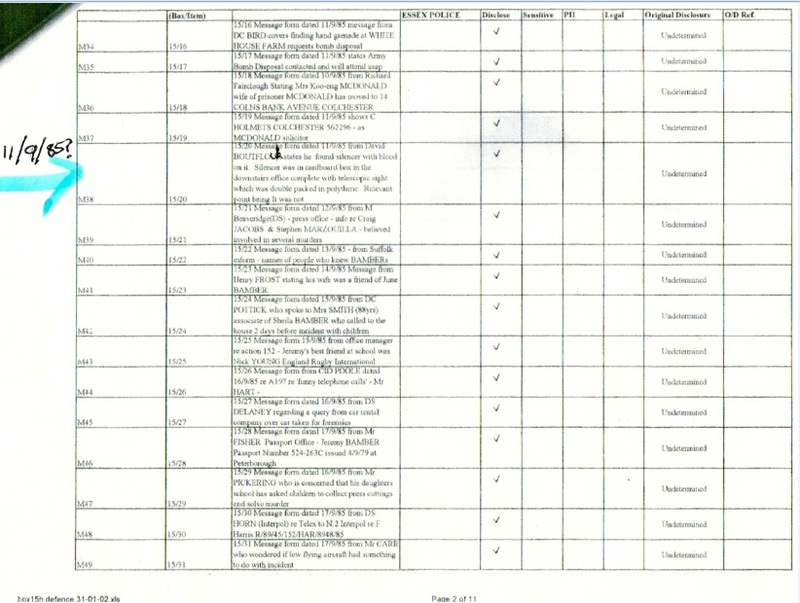 Once we do that it becomes apparent that this is actually a print out of an Excel spread sheet. Not a police telephone log. And if anyone still wants to insist this is from 1985, Microsoft excel didn't exist back then. So what is "box15h defence 31-01-02.xls" I can deduce from the name that this was made by Jeremys defence team in 2002 while they were going through the contents of box15 and making a summary of its contents to see what had been disclosed to them. This makes sense, because later that same year, Ewen Smith wrote to Jeremy stating what files in what boxes were still held under PII. Box 15 is not among them. Thus the defence have that call log in its entirety. Nothing has ever been made of this and why? My guess is that item 20 in box 15 is actually dated 11/08/85. And whoever typed out that spreadsheet summarising the contents of the box put a 9 instead of an 8 by mistake. An easy error to make considering both numbers are next to each other on the keyboard and the person doing this had by the sounds of things had a very boring task and was probably not paying too much attention. The police must have explained the plan to the relatives. David Boutflour was to look in the gun cupboard and find a silencer along with other items with the exhibit references given above. Which makes perfect sense for David Boutflour to call the police on the 11th of September telling them he found the silencer after only just being told by the police to go and find it there. I wonder what the police said back to him on the phone? "Well duh that is what we just told you to go and do!" The defence did not misinterpret the date relating to the contact made by David Boutflour (Message 38 -reference 15/20) regarding him contacting the police about him finding the silencer to the gun. All the other messages listed are all in sequence and with the exception of a couple of them are all in date sequence..
the reference ' box15h defence 31.01.02' was the date the CPS copied the message log to the defence in connection with the forthcoming 2002 appeal hearing. Ann Eaton handed over the second silencer on that same date, so is the suggestion that defence made a mistake with the date in that instance as well? Which part of the date? Ann Eaton handed the second silencer to DI Wright /DC Oakley on that occasion, but the other silencer was handed back to DS Jones by Peter Eaton - so, is it being argued that the defence are responsible for making all these mistakes concerning the same silencer? Great, let's blame the defence for everything, changing the date, changing the names of people who did this, that and the other, oh well if all else fails I suppose you could always fall back on the suggestion that the police themselves made an error, or a mistake, rather than simply accept that there were two Parker Hale silencers at the heart of this police investigation and the prosecution of Jeremy Bamber..
And, let's not forget the message dated 14th September 1985, where David Boutflour describes to DC Oakley the two different places inside the gun cupboard where he found a silencer? I suppose the defence altered the contents of that message which DC Oakey recorded in/on official police documentation! PC Widdon confirms in one version of his witness statements that a silencer was handed over by the relatives on 11th September 1985.. The relatives definitely contacted Essex police on 11th September and told them that they had got the silencer to the gun! Contacted police on 11th September 1985..
None of the relatives, or police officers, made witness statements in August 1985, stating, or confirming that the silencer (DRB/1) was found, and handed over to the police any sooner than 11 September 1985.. This has got to be significant! Everybody knows, that when the police receive an item of evidential value from any witness, that the police officer takes a witness statement on the day he or she took possession of the item, or at the very latest, a day or so later! The same silencer in the guise of 'SJ/1(22)' was taken to the lab' without the necessary exhibit label signed by the witnesses, and that evidence should have been excluded because the silencers integrity was called into question.. The lab' should not have accepted the silencer on 13th August 1985, because it was not in a sealed package, it did not have a genuine exhibit label attached to it, and the silencer had arguably been contaminated through mishandling by relatives and the police, beforehand! the silencer should not have been taken to the lab' without the proper safeguards in place protecting it's integrity! Relatives had pawed over it, so had Ds Jones, and DI Cook..
As I say, no witness statements were made before September 1985 concerning the 8ssue of the silencer, blood and paint.. It's a though the silencer didn't exist any time sooner than September 1985..